From the foo fighters of WWII to the ghost rockets of the early Cold War, UFO sightings have always seemed to be more frequent during times of conflict. In his book UFOs in Wartime, author Mack Maloney takes a look at sightings not just from 20th century conflicts but as far back as the time of Alexander the Great too. Richard Thomas: How did you first become interested in the UFO subject as a writer? Mack Maloney: I've always been interested in UFOs. Even as a kid, I read anything I could get my hands on having to do with UFOs. I think everyone likes to believe there's more to life than just life, and for me the thought that these things were flying around, appearing to people, things from some other place, I just found it fascinating and still do. So when I had the opportunity to write a book about them, I jumped at the chance. Richard Thomas: Why did you decide to focus on UFO reports during times of conflict in your new book UFOs in Wartime? 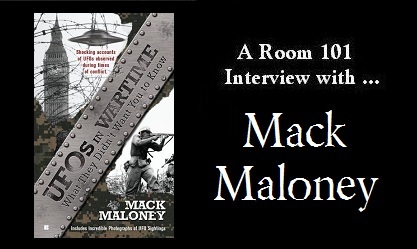 Mack Maloney: I was having lunch with my editor and I mentioned to him that from what I'd read in the past, it seemed that lots of people see UFOs during times of war or just before a war starts. I had just read something about the foo fighters, and I'd known about the UFO incursions over U.S. ICBM bases in the 60s and 70s, and I just had the thought that whatever UFOs are, they might be particularly interested in us when we are either at war or preparing for war. My editor thought that it might be a good idea for a non-fiction book, even though I'm primarily a fiction writer. We went through the process and the book is the result. Richard Thomas: The sub heading of your book is What They Didn't Want You To Know. What do you think the authorities don't want us to know? Mack Maloney: They don't want us to know what they know about UFOs. It's as simple as that. But the question is, what do they know? Do they know what UFOs are, and are keeping this news from us? Or do they not know what they are and they're keeping that news from us? It's a 50-50 question it could go either way. But they know a lot more than they are letting on. I'm absolutely convinced of that. Richard Thomas: One of the earliest UFO reports you discuss in the book is Christopher Columbus' sighting. What do you think Columbus saw that night and would you agree that too much attention has been given to the Kenneth Arnold sighting and Roswell Incident from 1947 as the start of the modern UFO era? Mack Maloney: What did Columbus see? It seems like he saw what would be normally described as a UFO a bright light, acting strangely in the sky, something that is not a star or the moon, or a meteor falling to earth. Whatever those things are, that's what Columbus saw. As for Kenneth Arnold's sighting being given too much attention, I agree that it has, at least in the context that these unidentified flying objects have been around for centuries. They didn't suddenly appear that day Kenneth Arnold saw them. What happened that day was the American press finally woke up to the story and branded them in this case, as flying saucers. Once that happened then everyone became aware that unknown things were flying through our skies. But up to that point, no one in the media and apparently not in the military either, had ever thought that the foo fighters of World War Two and the Ghost Rockets of 1946, and the Ghost Fliers of 1933 and all these things that were seen by Alexander the Great and by people in the Bible and in medieval times were all connected that they were UFOs too. We just hadn't given them a name yet. So, yes, the popular involvement started with Kenneth Arnold's sighting, but UFOs had been around a long time before that. And as for Roswell -- I don't think anything extraordinary happened there. No crashed saucer, no recovered bodies. Nothing. Richard Thomas: The Los Angeles Air Raid is perhaps the best-known UFO case from WWII in the United States. What do you think of the speculation that the US Army was able to shoot down and recover whatever was in the air on that day? Mack Maloney: I did not come across anything to indicate the Army or the Navy shot down anything that night. The only thing that came out of the sky were spent anti-aircraft shells falling back to earth after being shot at whatever was flying overhead and missing their target. What is apparent is that both the Army and Navy were completely baffled and confused about what happened and they were at each other's throats the next day. Richard Thomas: The most famous UFOs from the Second World War are the "foo fighters" spotted by both Allied and Axis pilots during that war. What are your thoughts on Nick Cook's book The Hunt for Zero Point in which he speculates that the Nazis could have been working on anti-gravity saucer shaped aircraft? Mack Maloney: I haven't read Nick Cook's book, so I can't comment on it directly. However, I will say that as far as the speculation that the foo fighters were actually Nazi super weapons, we reject that notion in the book. Simply put, the Nazis didn't have the resources from 1943 onward to even maintain their armies in the field, never mind create some futuristic flying machines that were seen doing fantastic things. By 1944, the Nazis were building the cockpits of their Me-262 jet fighters out of wood because they didn't have enough metal and steel to do the job. Second, if the foo fighters were Nazi weapons, why isn't there a single instance of a foo fighter firing on any Allied warplanes? If they were Nazi super weapons, why were they seen the Pacific theatre as well? Why was no vast super weapons manufacturing facility ever found in Germany after hostilities had ceased? And finally, if the Germans had these fantastic weapons, why did they lose the war? Richard Thomas: The Rendlesham Forest Incident is often called the "British Roswell" but Jacques Vallee has suggested that it was a psy-op. How likely or unlikely do you think that explanations is? Mack Maloney: I respect Jacques Vallee for all the tremendous work he has done in this field. And I've read only very little about his theory that the whole Rendlesham Affair was a psy-ops. But my first reaction would be to question whether the U.S. military or some U.S. intelligence service would actually run a psy-ops over the Christmas holidays. Why then? Government spooks have lives too. They go on vacation. They need time off. It seems like an unlikely time to conduct a psy-ops. Plus how was it done? Did the spooks construct a fake device that was able to float above the forest floor and then take off at a high rate of speed? Where they able to construct the half dozen large glowing lights that people saw in the sky one of those nights? Were they able to somehow stage the "crash" of some object into the woods and have it shine brightly with three vivid colors? Were they able to manipulate the radiation detection devices on aircraft flying over the forest to make it seem like the area was saturated with radiation? That's a lot of trouble to go through to psychologically test a bunch of Air Force types who, for whatever reason, couldn't get a holiday leave to go home for Christmas. Richard Thomas: What do you think are some of the other best UFO cases from the Cold War era, not just the 1980s but the Korean and Vietnam Wars too? Mack Maloney: The Korean War was pivotal in the U.S. government's investigation of UFOs. They'd closed up Project Grudge about six months before war broke out, basically saying UFOs didn't exist and that they were either misidentified aerial phenomena, the work of crackpots or people with delusions. But then, once the war broke out, a lot of U.S. pilots started seeing UFOs over Korea and the U.S. military realized they couldn't say all their pilots were crazy or hoaxers or delusional. So, they were stuck. Some UFO researchers believe that was one big reason the Air Force started Project Blue Book. So many of their pilots were seeing UFOs over Korea, they just couldn't ignore it. And there were some spectacular sightings. About two months into the war, three Navy fighter-bombers were about to bomb a North Korean convoy when they encountered two enormous flying discs. And I mean these things were gigantic. Then there were a couple cases of UFOs orbiting high above U.S. ships out at sea and playing hide and seek with carrier aircraft sent up to intercept them. There's an incredible story told by Dr Richard Haines in his book, Advanced Aerial Devices Reported During the Korean War, about a UFO appearing in the midst of a battle between U.S. infantry and North Korean soldiers. The object took fire from both sides, but then it bathed the American soldiers with some kind of ray, and two days later, nearly all of them were very sick. Really frightening stuff. I highly recommend the Haines book to anyone who wants to learn what happened in Korea when it came to UFOs. We just scratch the surface in our book. For Vietnam, we came across a number of episodes. All of the sightings from Vietnam are strange because, I believe, the war itself was very strange. The most well-known is probably the Hobart Case, where US fighter planes fired at UFOs off the coast of the DMZ and wound up hitting this Australian warship, the HMAS Hobart, and killing four Australian sailors and wounding dozens of others. A very tragic story that got very little play here in the States at the time. Richard Thomas: Are there any cases from the recent civil war in Libya or other recent conflicts you would like to include if you ever did a second edition? Mack Maloney: If we did a second edition, we'd have to start just before 9/11, and cover all the conflicts in the Middle East. That might take up the entire book: Iraq, Afghanistan, Pakistan, Libya, Syria maybe. That whole part of the world is turning upside down and when things like that happen, especially militarily, UFOs are usually on hand. Who knows what stories are out there, just waiting to be documented? Richard Thomas: Where can readers buy UFOs in Wartime and have you got any plans for another UFO book? Mack Maloney: UFOs in Wartime is published by Penguin-Berkley Books, so it's on sale at every bookstore in the United States and Canada. It can also be bought on-line at Amazon. Whether there will be another UFO book in the near future, time will tell. I would like to do another one, but in a strange way our friends in the UFOs will have to cooperate and provide us some good stories. And so far, they're not returning my calls.